The Fellowship was fortunate enough to obtain a copy of WOMANTHOLOGY: SPACE #4 from IDW Publishing. The stories are by: Jody Houser, Devin Grayson, and Christine Ellis. The art is by Sally Thompson & Kathryn Layno, Lindsay Walker, and Elva Wang, with colors by Ronda Pattison and letters by Robbie Robbins. WOMANTHOLOGY was created by Renae DeLiz. “Trinkets” finds a cat burglar stealing jewels and comes across a storytelling mask. Will she honor its wish to see the stars once again? In “The Smell of Sunshine,” Lt. Commander Macshay is the last survivor of a mission gone wrong. He is questioned by his superiors about the events, but what is true purpose of the mission? In “Drift,” a small ship discovers a dead man floating in space. What is so special about him that would have shipmates turn on each other? I’m shocked to find out that we have not reviewed any of these books. That was a mistake on my part that I hope to correct here. I’m glad that we have such a book to showcase the female talent in the comics industry, yet sad to think that it takes one for us to see such talent. These are well written stories with some great art to go with them. 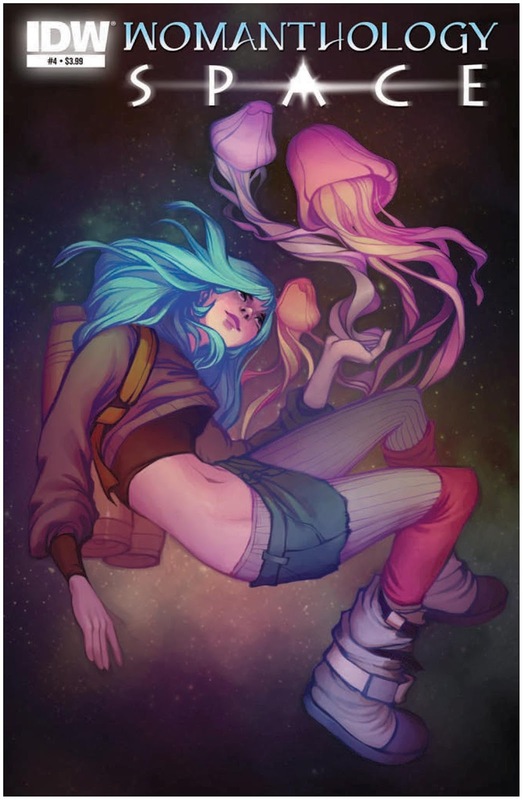 The issue also includes a very interesting article on how to make an atmospheric digital painting by Lois Van Baarle, and two beautiful pinups by C.M. Miller and Christianne Benedict. WOMANTHOLOGY: SPACE #4 is in stores now and available at www.idwpublishing.com.